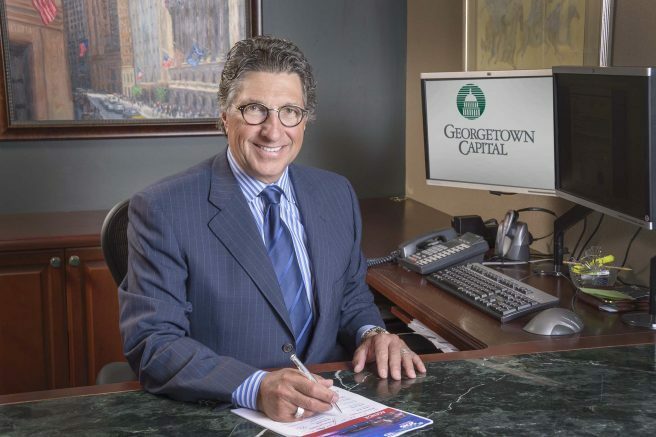 Williamsville Financial Advisor Joseph V. Curatolo, president and founder of Georgetown Capital Group, is being honored for his extensive charitable work by a national foundation. The Invest in Others Charitable Foundation is honoring Curatolo for his work with Roswell Park Cancer Institute in Buffalo. Curatolo is among the Top 10 fundraisers in the history of the Ride For Roswell. This year his team, Kids Just Want To Have Fun, and their affiliates raised approximately $270,000 for the Ride, which is about 5 percent of the total money raised. In addition, Joe and his wife Kathy have created a foundation to help enhance the quality of life for children undergoing cancer treatment at Roswell. The Invest in Others Charitable Foundation established its awards program in 2006 to recognize the charitable work of financial advisors and financial services firms in communities across the country and around the world. Financial advisors are nominated by their peers for actively giving back to nonprofits to improve their communities and make a difference in the lives of others. Hundreds of inspirational nominations for the Invest in Others Awards were received this year and reviewed by a diverse panel of leaders in the financial services industry. Georgetown Capital Group is based in Williamsville and manages approximately $500 million in assets for its clients. Securities and Advisory Services offered through Royal Alliance Associates, Inc. Member FINRA/SIPC. Insurance services offered through Georgetown Capital Group, which is not affiliated with Royal Alliance Associates, Inc.
Third party awards, rankings and recognitions are no guarantee of future investment success and do not ensure that a client or prospective client will experience a higher level of performance or results. These ratings should not be construed as an endorsement of the advisor by any client nor are they representative of any one client evaluation. Be the first to comment on "Georgetown Capital advisor honored for charitable work"